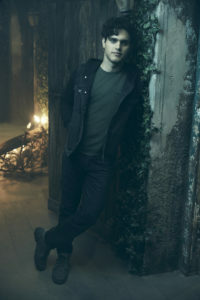 Aria Shahghasemi made his first appearance in the world of The Vampire Diaries and The Originals with the Originals episode “The Tale of Two Wolves.” Now on Legacies, premiering this Thursday, October 25 on The CW, he is bringing that character from that episode onto a weekly series, seeing his character Landon as both a possible love interest for lead character Hope and also dealing with the notion that his foster brother is a supernatural being. Continuing our run of interviews leading to Thursday’s premiere, today we turn the spotlight on to Shahghasemi, starting with a recollection of his first time working with “Hope” Danielle Rose Russell. Of course, Landon’s relationship with Hope changes in the opening minutes of this spinoff as their reunion involves her using her tribrid abilities right in front of him. “The first time he sees it is at the church when she opens the doors with her mind, and there was nothing going Landon’s direction for that,” Aria said about his character’s preparation for such a surprise. “He was just sitting outside and he didn’t know what he was doing, and then Hope showed up. And then Alaric who he doesn’t know walks up behind her with a crossbow, at a church, and then she blows the doors open with her mind, and then he sees his foster brother convulsing on the ground. I think there is no way he could have possibly processed it, so he was completely overwhelmed. He can’t understand it. He didn’t know it existed,” he continued. You can watch the interview video, including some details about Landon’s relationship with his foster brother Rafael and what it’s like to join such an iconic franchise, below. Come back to KSiteTV in the coming days for more Legacies cast interviews!